Cost effective ways to market your business. Our print advertising rates are some of the most cost effective in the city, reaching connected consumers who sincerely care about businesses like yours. 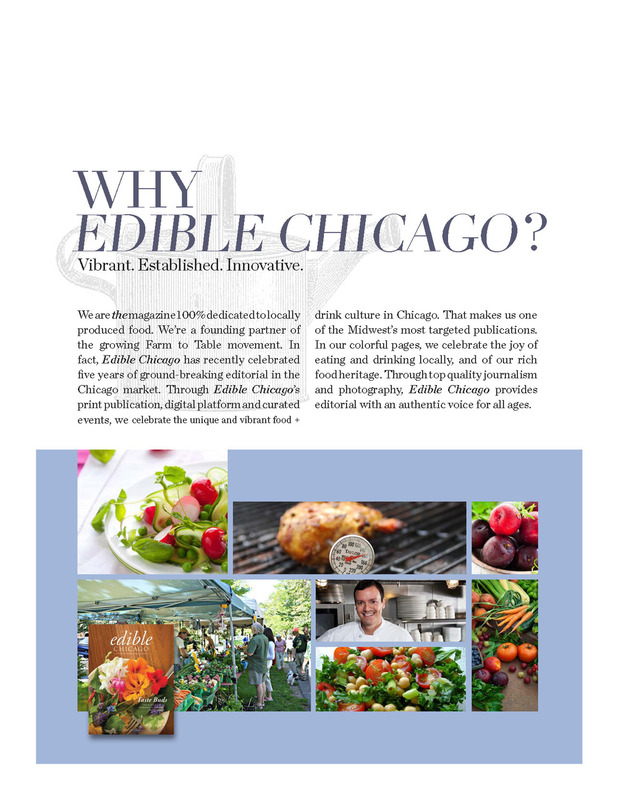 The Edible Chicago readers are loyal and genuinely want to engage with brands more deeply. These consumers seek out to know the person behind the product, whether it's a chef preparing their meal, a craft food or drink item from an artisan producer, or a local farmer that raised the meat or vegetables on their dinner table. These are Chicagoans who live sustainable, healthy lifestyles and are also more likely to shop locally and at independent businesses. When your advertisement is aligned with our award- winning editorial, together the message is authentic and credible. Readers tell us time after time that they read Edible Chicago cover to cover including all of the ads. And they keep our high quality publication around on a coffee table or in the kitchen for reference as a valuable source for information and inspiration. 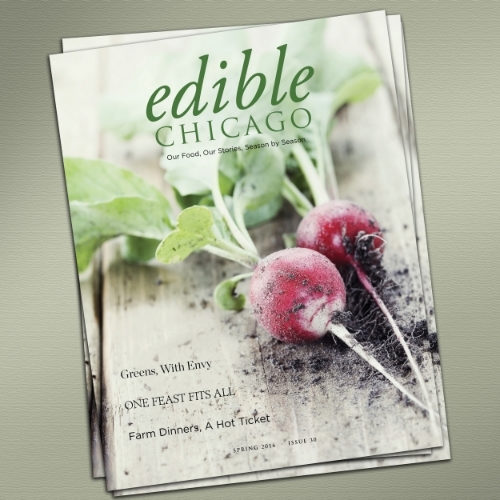 Edible Chicago is a high-quality magazine with engaging stories and beautiful photography about our food community-including seasonal recipes, garden tips and more. We're proud of the content we produce and the advertising partners that support our mission. Together in a partnership, we can inspire our readership to make choices for a healthier lifestyle. We welcome the opportunity to talk with you about creating a customized marketing plan for your business within your vision and your budget. Along with print and digital advertising, we offer sponsored content video, newsletters, podcast episodes and event participation. Call us today at 708.386.6781, or fill out the online form below and we'll get back to you promptly! Thank you! Will get back to you promptly! 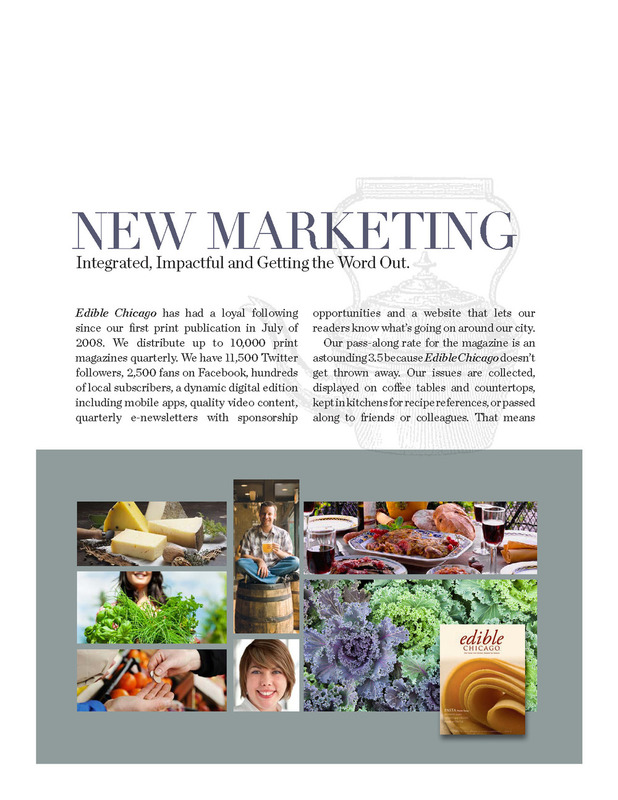 Sell Edible Chicago at your business or retail store! Edible Chicago will soon be available to retail stores for resale! Selling our publication in your store is a fantastic way to get more customers into your store. Time and time again we get calls from our loyal readership looking for the magazine. This is a great marketing tool on its own to bring in a new audience to your store. Talk to your school administrative professionals or a local non-profit for an opportunity to raise awareness and funds through selling individual copies or annual subscriptions of Edible Chicago magazine. A 50% profit for your organization per sale plus we’ll mention your fundraising drive in our marketing endeavors. Best day and time to reach you?